The Sustainability and Renewable Energy Program is a project-based learning initiative that currently engages Uniondale High School students in the creation of a Renewable Energy Showcase at the Cradle of Aviation Museum. This model will be used to engage more students from additional school districts in the upcoming 2012-2013 school year. Student lead project teams have been created in a variety of disciplines in which the teams work independently of each other on many tasks however they have collaborate in areas where overlaps have occurred. All teams will and have been responsible for researching and gaining a greater understanding of renewable energy. The two key components of the project are communication and teamwork. Project Management Team: DECA students serve as overall project managers and student mentors to the students at the STEM Magnet Academy at the Cradle. They are responsible for general oversight and coordination of various components of the project. Business Team: focuses on cost benefit analysis and all financial aspects of the project. Government Relations Team: identifies stakeholders in the public and private sector and work on communications and presentations to these audiences. Marketing and Public Relations Team: create awareness for the project and manage the flow of communications. Research Team: measures the carbon footprint and energy consumption of the museum and analyzes the results. Lastly the Technology Team: works on the measurement and installation of the renewable energy system. Westbury Public Schools in conjunction with the Cradle of Aviation Museum, Adelphi University, STEP-SUNY Old Westbury, Old Westbury Gardens and Freeport Public Schools offer two summer science enrichment programs for entering 8th and 9th grade students. The program services a mixed cohort of 100 students from the two school districts. This collaboration was initiated by both a proposed 2011-2012 tuition bearing program at the Cradle of Aviation and past partnerships with STEP at SUNY Old Westbury. Students entering the 8th grade are offered an environmental science program designed to prepare them for the rigor of the upcoming year. This summer enrichment experience provides students with mathematics, language arts and science components designed specifically to strengthen identified skill sets needed. Students take part in various environmental projects and compile, maintain and expound on scientific data to support their work. These projects include the construction of an aquifer, atmospheric simulations and infrared maps. Additionally, the learning by teaching methodology will be implemented with the students creating projects to teach younger students about renewable energy and environmental topics. Students entering the 9th grade (academy freshmen) have an opportunity to hone their science and math skills while being introduced to fundamental concepts in physics and geometry. The resources of the Cradle of Aviation Museum are utilized to connect physics and mathematical principles to real world applications. One such application required has been that the students construct solar powered vehicles, which are exhibited and raced at a culminating event. In an effort to encourage college mathematics and science majors to pursue careers in STEM education, student teachers are recruited. Under the supervision of the Lead Science teacher and Program Coordinator, student teachers from SUNY Old Westbury and Adelphi University are required to conduct part of each ninety minute workshop at the Cradle of Aviation Museum and help mentor the students who participate in the “teach by teaching” method. If your organization or school district is interested in getting involved with or developing a program, please contact Education Manager, Catherine Bingham at 516-572-4028 or use the form below. 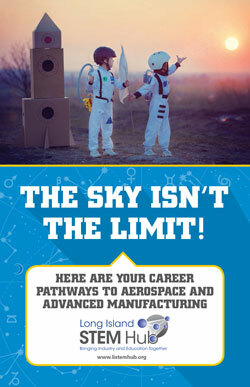 Long Island is full of opportunities for young men and women with big dreams and an interest in science, technology, engineering, and math (STEM) to become the next generation of innovators in the aerospace and advanced manufacturing fields. Use this guide to explore these fields, learn how you might fit in, and discover resources, camps, and even pre-professional internships designed to encourage your curiosity and launch your career! This guide was produced by the Long Island STEM Hub and the Cradle of Aviation with generous support from The Long Island Community Foundation.